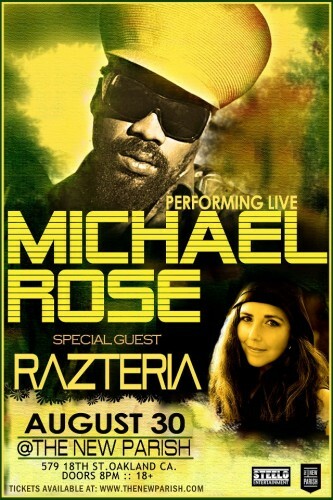 Michael Rose Live at The New Parish! performing live at The New Parish in Oakland! From his early solo work for Niney the Observer through a trailblazing stint as lead singer of Black Uhuru – netting reggae music it's first Grammy – to his magnificent later solo work, Michael Rose has consistently remained at the helm of one of reggae's most far – reaching sounds. He can always be counted on to be challenging, topical, musically expansive and lyrically visionary – no small feat in a genre that sets aside old styles like ska, rock steady, roots and dub for the rest of the world to mine as it drives relentlessly forward. Rose has often flown in the face of tradition, walking away from Uhuru at the peak of their popularity, incorporating sounds and styles lesser artists might eschew and following his own instinct where others might seek safe haven. As a result he has retained a top spot in a field that has seen many come and go. Razteria can be described as a Fusion of early No Doubt and Sade. Her music unites Reggae, passionate Latin grooves and Rock, powerful messages and musical genius. Described as “musically adventurous” and “a one of a kind breaking of all rules” (C. Foster, Reggae Update, getthebeat.com), Razteria’s songwriting reflects her passion and strong commitment to justice. Razteria currently in the studio producing “maZ raZteria”, a sequel to her 2010 production RazteRia, to be released in 2012.